Laurier’s Faculty of Education will soon celebrate its 10th anniversary. With award-winning professors, two unique degrees and numerous community-outreach programs for teachers, children and families, it is no surprise that the faculty has been recognized by Maclean’s despite its relatively young age. Under the leadership of Dean Colleen Willard-Holt, who is now in her second five-year term, the faculty has developed strategic plans, experienced enrolment growth through the addition of the junior-intermediate division and the minor in education, and implemented a unique professional development school model — one of the only programs in Canada to do so. Every year, the faculty receives over 900 applications for 60 spaces in the Bachelor of Education program, an intensive two-year experience that prepares well-rounded teachers who are ready for the challenges of today’s classrooms. 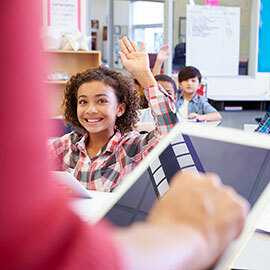 Laurier’s Bachelor of Education focuses on pedagogy and how to deliver the Ontario curriculum in the best way possible. Through the professional school model, students are placed at one school for an entire year, rather than having several three-week placements, before moving on to a second school in year two of the program. “Teaching is a lifestyle — it’s not a nine to five job — and our program helps teachers understand that it’s all about what’s best for the kids,” says Willard-Holt. Through the university’s placement model, Laurier students understand what it takes to run a school and what it means to be part of a school community. They are integrated in the school — parents and children see them as teachers and they feel a real connection and sense of ownership. “There’s a requirement from the government that students have an 80-day practicum. At Laurier, we give students 196 days — far more than any other program in the province,” says Willard-Holt. The opportunity provides Laurier’s students with ample experience and in-depth preparation for what their career will be like. The Bachelor of Education degree at Laurier, through its practicum model, also promotes a culture of students giving back to their two placement schools. “Many of our students have special programs they run within the school — a chess, drama or sports club, tutoring or drama groups. Our students are doing all kinds of things that allows them to give their own personal talents back to the school,” says Willard-Holt. Laurier’s Faculty of Education also offers an interdisciplinary Master of Education, which is designed to be a two-year part-time degree. The course-based graduate program is attractive to educational leaders and professionals in a wide range of corporate and not-for-profit industries, health and community service organizations, and postsecondary institutions, as well as public and private school systems. “The master’s degree is a way to go broader with research as well as deeper into theories of education and philosophical approaches to teaching. Laurier’s Faculty of Education has experienced growth since it first started in 2007. Those efforts have been paying off. Maclean’s recently ranked the faculty at 13th in the country and, for last year alone, the placement rate for graduates was between 95 to 97 per cent. “Our partnering boards are very committed to our students and we see that they prefer to hire them because they know what they can do in the classroom,” says Willard-Holt. “We’ve been told over and over again by principals and school boards that when they have someone from Laurier’s education program on a hiring panel their ears perk up because they know what our graduates have to offer,” says Willard-Holt.